I am a coffee addict. Seriously. One day last year I started feeling light headed and my heart was racing, and then I remembered that I had drunk about 7 cups of coffee without really noticing, so I've cut back a bit since then, and when I'm at work I usually brew 1/3 decaf to 2/3 regular, but I still consider myself an addict. A few weeks ago our coffee maker stopped working, so we were using our coffee press as a back-up. Okay, still getting my coffee, so fine. But then, during a particularly intensive spin cycle, the coffee press was knocked off the kitchen counter where it sat above the washing machine. 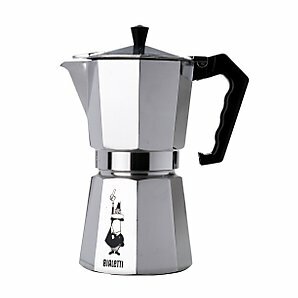 There was much tearing of hair and gnashing of teeth until I remembered that we have a Bialetti Moka Express. They are fantastic, and pretty stylish looking as well, I highly recommend them. However, they are a bit of a faff (sp?) so I'm looking out for a new coffee press. This time, I'll opt for one of those thermal versions so the coffee stays hot, but also so the next time it's thrown onto the floor by my laundry, it won't break. 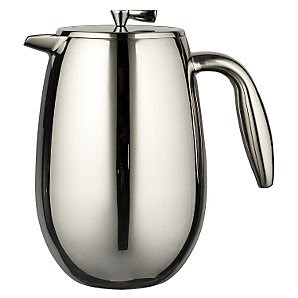 This Bodum version is lovely, with its curvy, minimalist shape. My favourite place to buy housewares is John Lewis. It's a bit pricey compared with other department stores, but the Buchanan Galleries location is handy for my flat, and I like the fact that they have profit sharing, so everyone who works there, from the guy who delivers groceries from Waitrose, to the people who contribute to corporate strategy are all partners. And the fact that last year they all earned the equivalent of an extra month's worth of salary from profits, I think the policy must work pretty well.